So a group of friends met me at Skate World in Linda Vista. The event? Roller Disco (or #RollerDisco as we call it in the age of Twit). The reason? To have fun. And have fun we (for the most part) did. There were some bruised knees, my bottom hurt for a few days and one lucky unfortunate twisted a knee exiting the hard wood rink floor. Good news? The carpet landing was at least a little softer. If you lived Kevin Six's film Golden Hill Farmer's Market, you're going to love The Making of Golden Hill Farmer's Market even more. This time the Trees (the r and the e are silent) go to the Golden Hill Farmer's Market and meet all kinds of wonderful people. But of course they are superior to all of them. This is because they drive a Smart Car, film with a GoPro iHero and carry their free-trade produce in a sustainable (doushey) basket. Have you ever wondered how to get to the Apolliad Theatre at Mesa College? There's a great play,No Child... there in May and I want to see it. So I went there. The hashtag #dousheybasket can be used to refer to anything you pay too much for, especially if you pay too much for it in order to look better to the people who shop at the Little Italy Farmer's Market. Besides, no matter how hard you try my wife and I are the doushey-est people there. It all started on a normal Saturday afternoon at the La Jolla Farmer's Market -- oddly the second doushy-est farmer's market in the county. Jennie wanted one of the robo-baskets that a nice European-looking woman was selling. We asked the price. $40. After her pitch (it was made in Germany with strong materials and Eurpoean design touches and better engineering), we thought it was worth the price. Especially because it would complete our doushey traveling-to-farmer's-markets-ensemble: a Smart Car. This became apparent when we went to the Little Italy Farmer's Market in the Smarty (only we can call it Smarty; because you don't own one, you have to call it The Smart Car). We tooled past all the Range Rovers, Fiats and Priuses; we popped into an impossibly small parking spot and -- the piece de resistance? We opened the back window (you can do that with the touch of a button in a Smarty) and pulled out the $40 basket. We knew it was cool because people didn't look at us until after we'd passed. It was such a pleasure paying extra for things and putting them in out too-small, over-heavy and exorbitantly expensive Doushey Basket. How do we know we paid too much for it? The only thing we do that hipsters don't do, apparently, is shop at Safeway, where we saw the very same basket for $9. It's still worth it, though. Repurposed Vinyl. It's about time. How long have those records been collecting dust? Want the song on Mp3? You can find it! Want something cool to hold stuff? Made out of retired records? Look no further! Record Holders! (http://coolrecordholders.blogspot.com/) sells, well, cool record holders. 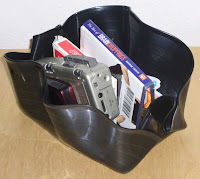 Records made into boxes, bowls, pencil holders and... well. It's just a really coo concept. See for yourself! Click a photo and go crazy!